According to theoretical studies, narrow graphene nanoribbons (GNRs) with atomically precise armchair edges and widths less than 2 nm have a bandgap comparable to that in silicon (1.1 eV), which makes them potentially promising for logic applications. Different top-down fabrication approaches typically yield ribbons with width > 10 nm and have limited control over their edge structure. We develop new bottom-up approaches for gram quantities of high-aspect-ratio GNRs that are only ~ 1 nm wide and have atomically smooth armchair edges. The important characteristics of these GNRs are their large bandgap, their large lengths, the ease with which they can be deposited on any substrate, and their ability to be visualized by conventional microscopy techniques. 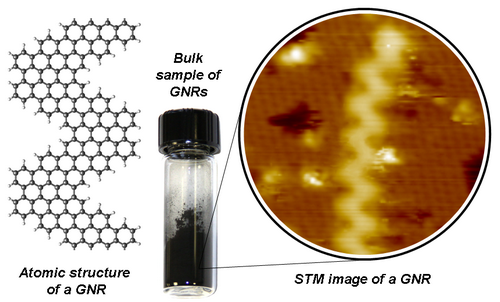 Although we have demonstrated the synthesis of only one type of GNRs (see the highlight picture), we believe that GNRs with other structures could also be synthesized by a similar bottom-up approach. Further device studies will reveal if these GNRs with large electronic bandgaps could be suitable for high on-off ratios field-effect transistors, logic gates, and photovoltaic devices. T. H. Vo, M. Shekhirev, A. Lipatov, R. A. Korlacki, and A. Sinitskii. Bulk properties of solution-synthesized chevron-like graphene nanoribbons. Faraday Discuss. (2014) Advance Article. T. H. Vo, M. Shekhirev, D. A. Kunkel, F. Orange, M. J.-F. Guinel, A. Enders and A. Sinitskii. Bottom-up solution synthesis of narrow nitrogen-doped graphene nanoribbons. Chem. Comm. (2014).